Glass blocks make an area look extra different. It makes a possible dull and ordinary space in a home look more interesting and appealing. Glass blocks are commonly known to serve as alternative for windows, wooden walls, shower partition and many more. However, glass blocks do not necessarily mean that they are only meant to be household furniture or structures; they can be as simple as a decorative piece. Some people may not be aware of it, but glass blocks are also used as a decorative ornament in households or wherever else they are suited. Glass blocks become wonderful pieces of ornaments when certain decorations are added in them. They can be made as a center piece, a side table decoration and many more. As compared to glass blocks which are used as walls or windows, a decorated glass block can either be two pieces of glass block combined together or simply, just a piece of glass block. This piece of glass block can be decorated in any way, depending on the creativity and imagination of a person. Some decorated glass blocks are adorned with ribbons and synthetic flowers. This make them look like a gift or a modernized vase. Others even put lighting inside their decorated glass blocks. This makes the decorated glass block look more appealing since the light provides an added twist to it. For some, decorated glass blocks are ideal presents for a particular occasion. They personalize a glass block in accordance to the celebration or the personality of the receiver. Others would even decorate a glass block in such a manner that it becomes nearly a picture frame. They simply insert a picture in between the two halves and add lighting in it to make the picture look more visible. Decorated glass blocks make perfect pieces of decorative items. It is a matter of creativity and imagination which will determine its over all uniqueness and appeal. If you would like to build a bar that is longer or deeper than the one shown, add five blocks, five vertical spacers, and one tube of sealant for each column of block you would like to add. When you select a countertop for your bar, be sure to account for the amount of overhang you want on each side. The countertop on the bar shown here is 18” wide x 56” long. These dimensions provide 2” of overhang on all 3 sides of the bar. Before installing, make sure the jamb (anchor wall) is plumb. Make sure the floor is flat, level, and you have enough space to install the bar. The finished overall dimensions will be 14” deep x 54” long and 40” high (not including the countertop). 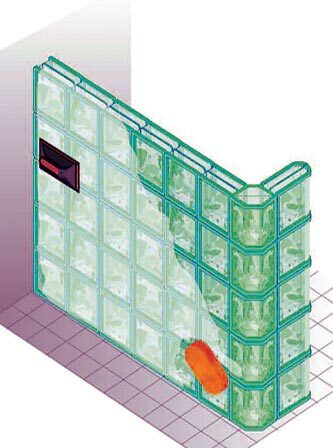 You must install the glass block on hard surface. DO NOT install on top of carpet. Prepare the horizontal spacers. You will use five full 40” spacers. Cut the other two spacers into 8” lengths. You will end up with ten 8” pieces. Trim one end of five 8” horizontal spacers to fit the shape of the EndBlock by trimming off the two corners (3/4” from each corner at a 45 angle). Place one 40 horizontal spacer with anchor inserted into the end on the floor with the anchor at the wall. DO NOT attach the anchor. Place an 8” spacer, then a half HEDRON horizontal spacer (with tabs broken off), and an 8” spacer with trimmed corners on the floor. Place a regular glass block on top of the horizontal spacer tight against the vertical spacer in the jamb. Continue alternately installing vertical spacers and glass block until there are six blocks. Insert a special vertical spacer from the HEDRON spacer package after the six block. Place the EndBlock on top of the trimmed spacer. Check the first row for level lengthwise and crosswise. Make sure the blocks are straight and plumb. If necessary, insert shims under the horizontal spacers to leve the row. Use a flat blade screwdriver to lift the horizontal spacer as you insert shims. Start with an 8” spacer with anchor inserted at the wall. (You will alternate the 8” and 40” pieces so the spacer joints will be staggered). Place the assambled spacers on the top of the first row. Mark the location of the anchor V notch on the wall. Note: This mark will be used to draw a plumb line on the wall. Apply two 1/4” beads of sealant to the floor 1/4” inside the traced outline of the spacers. Replace shims in the marked locations. Reinstall the bottom 40” horizontal spacer and anchor, 8” spacer, half HEDRON spacer then 8” trimmed spacer, pressing them down into the sealant. DO NOT attach the anchor. Line up six regular bloks, one HEDRON and one EndBlock to install on top of the horizontal spacer. Apply two 1/4” beads of sealant across the top of the blocks, just behind the raised edges and inside the top perimeter of the HERDON unit. Note: These blocks will be turned over when installed so the sealant beads will contact the bottom horizontal spacer. Always apply the sealant to the blocks, not the horizontal spacer. Apply four 1/2” dabs of sealant to a vertical spacer, 1/2” from each corner. Press the vertical spacer into place over the anchor. Apply four 1/2” dabs of sealant to the vertical spacer, 1/2” in from each corner. Install the first block with the sealant beads down. Push the block firmly against the wall and floor. Applay four 1/2” dabs of sealant to the side of the first block, 1/2” in from each corner and press a vertical spacer into place on the sealant dabs. Apply four 1/2” dabs of sealant to the vertical spacer, 1/2” in from each corner. Install the next block with the sealant beads down. Continue alternately installing vertical spacers and glass block in this manner until there are six blocks. Install a special vertical spacer on the side of the sixth block. Check the first row for level lengthwise and crosswise, and adjust shims as needed. Apply two 1/4” beads of sealant on top of the first row of blocks, just behind the raised edges and around the top perimeter of the HEDRON unit. Install the assembled horizontal spacers on top of the first row of block, with an anchor inserted into the jamb end. Make sure the spacers fits firmly on the glass blocks. Align the V notch in the anchor with the plumb line drawn on the wall, and attach the anchor using the screws provided in the anchor pack. Line up six regular blocks, one HEDRON unit and one End Block to install on top of the horizontal spacer. Apply two 1/4” beads of sealant across the top of the blocks, just behind the raised edges and inside the top perimeter of the HEDRON unit. Install the glass blocks and vertical spacers in the same manner as the first row, alternating vertical spacers and blocks. Note: Be sure to install special vertical spacers on either side of the HEDRON unit. Check the row for level lengthwise and crosswise and adjust shims as needed. Install the third, fourth and fifth rows in the same manner. Remember to alternate the 40” and 8” horizonatal spacer pieces. Important: The ProVantage Surface Grout was designed and tested for this application – DO NOT SUBSTITUTE! Caution: When using sealant and grout, avoid contact with skin. Safety glasses and impervious gloves are recommended to minimize skin and eye contact. Provide sufficient mechanical ventilation. DO NOT finish the joints until sealant has cured for 24 hours. Remove any sealant squeezed out from the joints with a utility knief. Mix 1/2 bag of grout according to the directions on the bucket. Since this project only requires 1/2 bag of grout, you can use the rest of your next project. Note: The bar will be a bit flexible until the grout has cured. Use a damp tile sponge and clean water to wipe off excess grout. Wipe in multiple directions, diagonally across the blocks to prevent removing grout from the joints. Rinse the spong frequently. Let the grout set for 15 minutes, then wipe it again using clean water. Let the grout cure for 4 hours, then use cheesecloth to polish any film off the blocks. Apply sealer to the grout lines with a paint brush. Immediately wipe sealer off glass surfaces to prevent it from adhering to the glass. Apply a second coat of sealer once the first coat is dry. After the grout has cured for 72 hours, caulk along the floor and wall with a bead of sealant. Cut two pieces of perimeter channel, cutting one to 47”, the other to 7”. Drill two holes at the cut ends of the perimeter channel pieces to replace the ones that were cut off. You should now have two holes in each end of both channels. Place the 47” piece of channel on top of the long section glass block, tight against the anchor wall. Place the 7” piece on the top of the EndBlock. Set the countertop in place and check it for level. Make adjustments as needed. Once the top is level and positioned correctly, trace around the perimeter channel on the underside of the countertop. Place the countertop upside down on a flat surface and applay 1/4” beads of sealant inside the perimeter channel outline. Place the perimeter channel pieces in the marked locations and attach them with #6 x 3/4” flathead screws through the predrilled holes. Apply 1/4” beads of sealant in the perimeter near the vertical legs. Install the countertop, making sure the sealant beads make contact with the glass block.